Released today, Cascade Crossroads is a 30-minute documentary film chronicling the story unfolding over and under Interstate 90 just east of Snoqualmie Pass in Washington’s Cascade Mountains. Here at the intersection of a major east-west transportation corridor and a crucial north-south wildlife migration corridor, a monumental project combining conservation, collaboration, and innovation led to the construction of North America’s largest wildlife crossings project in conjunction with major infrastructure improvements for motorists. The full film is available below and on the Cascade Crossroads and Conservation Northwest Facebook pages, as well as on YouTube and other sponsor video channels. Screenings and events will be hosted around the region in 2018! The I-90 Snoqualmie Pass East Project, and the wildlife crossings and roadway improvements within it, is a win-win for people and animals that offers a new model for major infrastructure projects bisecting wild places. Commissioned by the I-90 Wildlife Bridges Coalition (of which Conservation Northwest is the administering organization and fiscal sponsor), the Cascade Crossroads film aims to not only share this unique story but also inspire action in other landscapes facing similar tensions between wildlife and roadways. The film was produced by Ted Grudowski, a local filmmaker and long-time Conservation Northwest supporter. Formed in 2004 and representing more than two dozen organizations and businesses, the I-90 Wildlife Bridges Coalition’s mission was to advocate for high quality wildlife connectivity measures in the I-90 Snoqualmie Pass East Project, while ensuring the habitat adjacent to these structures contributes to their success. 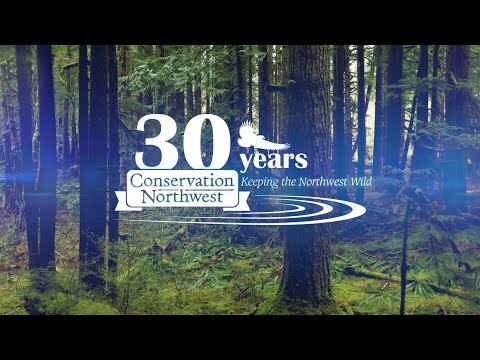 Conservation Northwest is the administering organization and fiscal sponsor for this coalition. If you are interested in hosting a screening of Cascade Crossroads and discussion about wildlife crossings at your organization, business or a local event space, please contact our staffer Jen Watkins, I-90 Wildlife Bridges Coalition Coordinator, at jwatkins (at) conservationnw.org with your name, contact info, affiliation and event idea. Thank you! Since 2000, through The Cascades Conservation Partnership and the I-90 Wildlife Bridges Coalition, we’ve led efforts to reconnect Washington’s north and south Cascades by protecting and restoring habitat and establishing safe wildlife crossings under and over I-90. These two coalitions represent only part of Conservation Northwest’s involvement in this area, which is organized internally under our I-90 Wildlife Corridor Campaign. This larger campaign includes our role administering coalitions as well as on-the-ground habitat restoration around the new wildlife crossings through volunteer and staff revegetation work, continued forest restoration in the watersheds of the Central Cascades, and wildlife monitoring and snowtracking through our Citizen Wildlife Monitoring Project to document wildlife movement in this corridor.